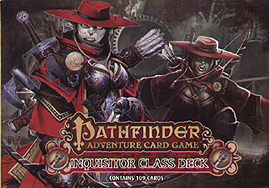 Root out enemies of your faith by any means necessary with the Pathfinder Adventure Card Game Inquisitor Deck. This 109-card set, compatible with any Pathfinder Adventure Card Game Base Set or Pathfinder Society Adventure Card Guild organized play campaign, brings three new characters and a battalion of weapons, spells, and other boons to bear on your foes. Customize your inquisitor, smite your enemies, and bolster your allies with the Inquisitor Deck today.